I love it! Your Logan is one tough looking customer. 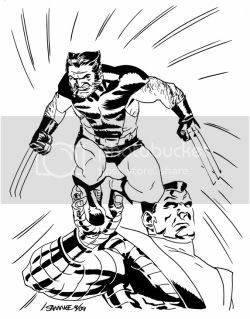 I like the stoic expression on Colossus' face and the smug, cigar-chomping visage on Wolverine. This one's a lot of fun. That's what we in the biz call a bitchin' camero, chris. Sweet bejeebus you need to be drawing the clawed canucklehead on a regular basis. It WAS a lot of fun, Matt. Glad that came through here.